RAPAPORT... Gem Diamonds’ sales slumped in the fourth quarter as the miner produced fewer valuable stones at its Letšeng mine. Proceeds fell 40% year on year to $41.7 million in the three months ending December 31, the miner said Thursday. While sales volume rose 5% to 33,140 carats, the average price dropped 43% to $1,259 per carat, reflecting “lower-quality recoveries” at the lucrative mine in Lesotho. Production fell 3% to 29,523 carats for the period. The fourth-quarter slowdown came despite a strong year for Gem Diamonds, with sales up 29% to $266.6 million for 2018. The company unearthed a record 15 diamonds above 100 carats in 2018, compared with seven in 2017, resulting in its average selling price jumping 10% to $2,131 per carat. In January, it found the 910-carat Lesotho Legend, which it sold in March for $40 million. “The large-diamond recoveries continued during the [fourth quarter], with three diamonds greater than 100 carats being recovered, resulting in the highest number of these recoveries in a single calendar year,” said Gem Diamonds CEO Clifford Elphick. Recoveries of diamonds weighing more than 20 carats leaped to 257 from 213 the previous year, while nine stones fetched more than $1 million each. Production for the year rose 13% to 126,875 carats. Sales volume grew 17% to 125,111 carats. During the fourth quarter, the company sold a 4.06-carat pink diamond for $64,067 per carat — the highest per-carat price it achieved for a stone all year, it noted. The miner expects Letšeng production to fall to between 114,000 and 118,000 carats in 2019. It anticipates sales volume will decline to between 115,000 and 119,000 carats. The company has commenced manufacturing of its pilot plant, which will enable early detection of large diamonds and reduce damage from extraction. The project will be commissioned at the end of the second fiscal quarter. 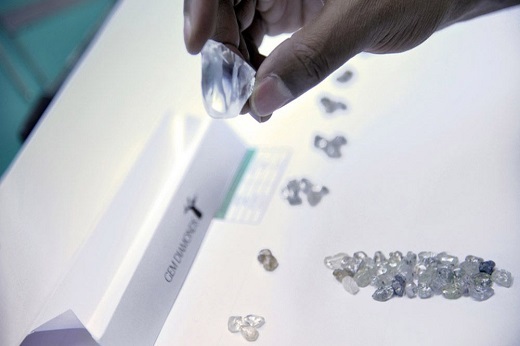 Gem Diamonds’ stock fell 5% in early trading following the results.